We know you want to make sure your generosity does as much good as possible. That’s something we take very seriously because you make our work possible. To serve children and families, we have to serve you too. That’s why we want to be totally transparent about your money. It amazes me how each and every single need that we have, the Lord has met through the obedient servanthood of our supporters. Your donations provide practical, direct support, with no hidden – anything. 100% of the money that is donated to The Tack Room is used for The Tack Room and the children we serve. **A note about this years report. As you may or may not have noticed I have removed the ability to give donations online. Looking over our numbers it just doesn’t make sense to me to continue using a third party to handle donations via online. This past year the fee for such not including bank fees came to $345.00. I can buy a lot of new socks and underwear with that! 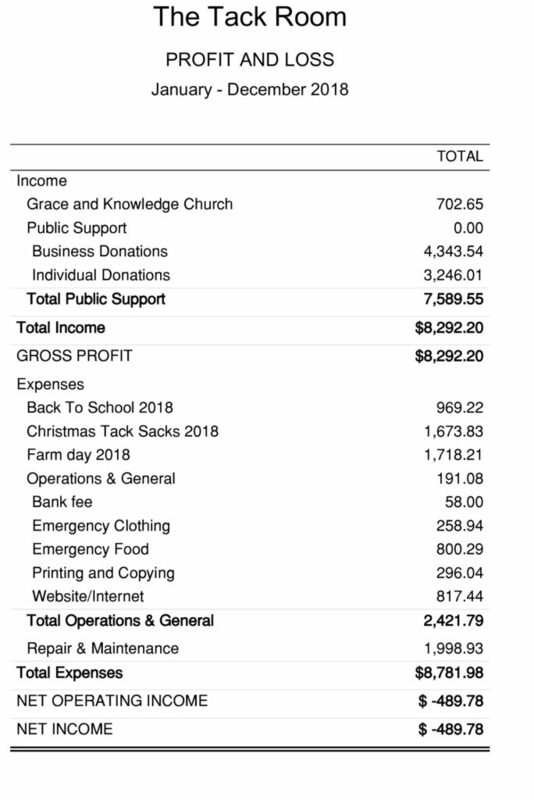 I said a 100% of our donations go to support The Tack Room and its children, and although that is something that a lot of bigger ministries need, I just feel it’s something we can do without. You are always welcome to donate via snail mail or by dropping it off to The Tack Room. Thank you for understanding and I am sorry for any inconvenience this may cause.